A funny and thought provoking investigation into fear of growing old. Suitable for the immature and decrepit alike. Single, childless and fast approaching 40, Martinez anticipates a sad and lonely old age. Will she become a wise and respected old sage, or a dreary old hag who goes on and on about how she used to be a cutting edge performance artist. 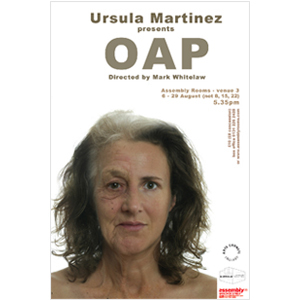 Using a series of interviews with old age pensioners Ursula presents her fears and paranoia about growing old alongside some comforting, harsh and illuminating words from those with first hand experience.